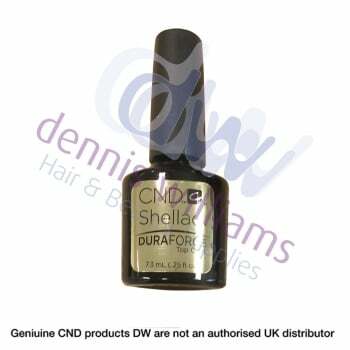 CND Shellac Duraforce Top Coat 7.3ml. Ideal for use on weak or damaged nails, the CND™Shellac™ DuraForce™ top coat is the perfect finish to your client’s manicure, offering an increased barrier of protection alongside a beautiful, glossy finish. This innovative formula provides weakened nails with 14+ days of high performance wear and causes no nail damage. Designed with breakthrough technology, this durable top coat is a great addition to your CND™Shellac™ service and will allow you to provide every client with the perfect nail finish.